Productivity - Nekaro & Co.
Good news though. I did manage to get another knitting project finished! 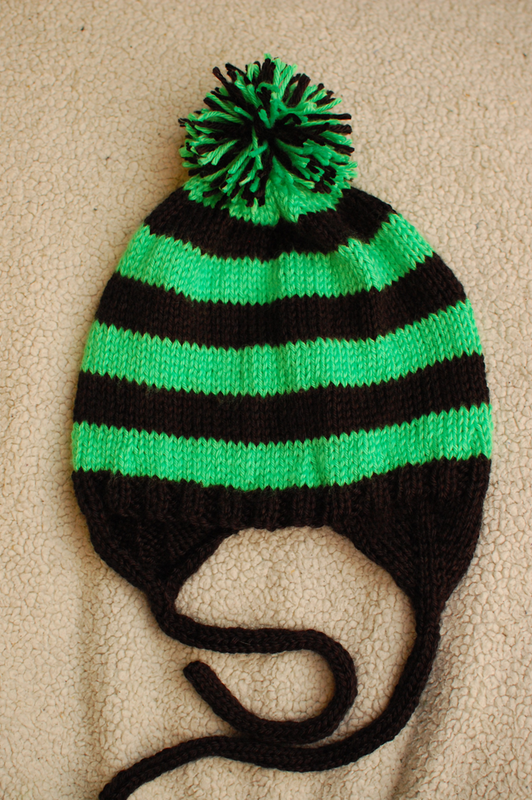 An earflap hat for Neil. Luckily he pays no attention whatsoever to what I am knitting. I actually started on Friday, but it just did not feel or look right to me. I cast-on three times and frogged three times. Finally just ended up sort of making up the earflap part of the pattern I was using. I have not been knitting anywhere near long enough to be making it up as I go along, but you know what? It worked. This was the best picture I could get to show the color of this yarn. It's a neon green, but so hard to get right on camera. He loves that color for some strange reason, but I didn't want his head to look like a big neon green beacon so I mixed it up with some black. Haven't really ever done a project with stripes before I am thrilled with the way it turned out! Yay for lazy weekends in pajamas! Those are the BEST kind of weekends in my opinion. The hat is super cute! That hat turned out super cute. I'm glad you got to have a lazy weekend. You deserved it.